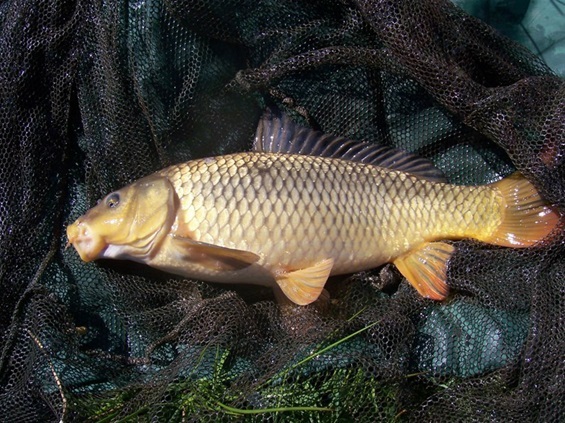 Carp fishing for me was once a rod and a reel, a bag and a net. I can see the sixteen year old "me". It is the early Eighties and I’ve walked two miles to a spot on the Stourbridge Canal which we always called “Cables Corner”, because of the overhead power cables. It is a warm day, but I have no water with me and no food of any kind. I have bait, however, – a few slices of white bread, for I am here to fish. My net is a 24 inch early “pan” job with flat aluminium arms. I’ve yet to fill it, and a few years on it will explode with the weight of a canal common, - just short of 9lbs! My bag is small – a green hessian job from the Army and Navy Store and I’m wearing a communist revolutionary camouflage jacket, from the same fascinating emporium, and it's made of rather flimsy cotton, certainly not thorn-proof!. But it matters, that camouflage, because I’m not only here to fish for carp, I’m here to stalk one out. Canal carp fishing is also close range fishing, for obvious reasons, and the water is gin clear. A recession is on, and there aren’t so many boats passing by. Is this why the bubbling Canadian pond weed and sagittarius beds in the margins are so luxuriant? Crouching down, I throw out a few free offerings of crust and before long, they are taken. Lips are smacking and ripples are spreading. 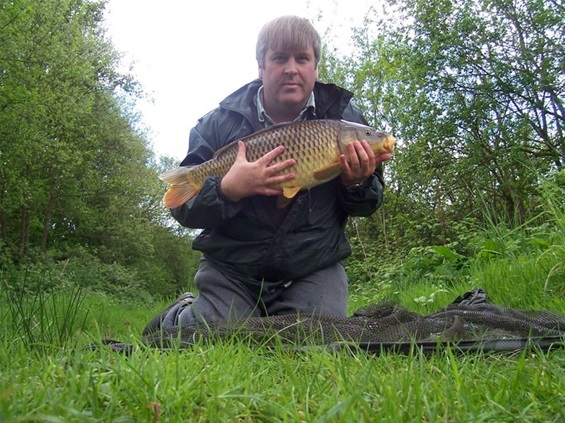 I hook up a piece of crust – carp hooks in the Eighties are hard to find, and I’m using a Mustad “Kirby” pattern hook – the same hook that has virtually straightened on me, with some of the fish I've played! These days, even though I rely on a bike or public transport, I tend to weigh myself down. Things are getting out of proportion and so yesterday, May 16th, 2013, I decided to take as little tackle as possible to the “The Other Pool”, in a bid to recapture something of my youth. The day started so well. I crept down the bank - the side in the sunlight - and I soon noticed ripples by a sunken branch. A moorhen, perhaps – or maybe a duck? I crept a little closer and saw it was a common carp. I threw in a few free offerings, just like old times, and within a few minutes the bread was being taken. My goodness, it was frustrating, and exciting too! Then the smallest group in a group of about six raced up and took the crust. Despite a modest weight of 5lb or so, it was a tricky moment because there was a small sunken tree to my left and a sunken branch to my right. 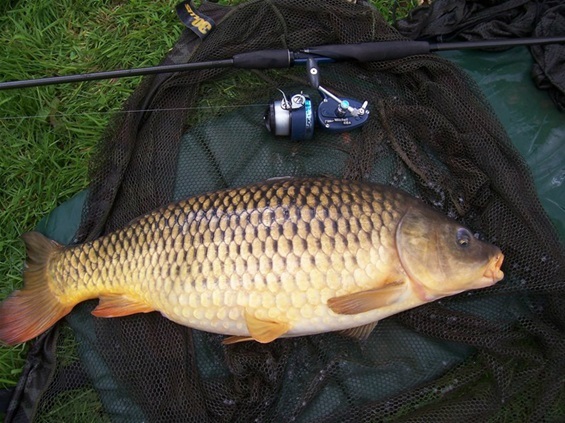 However, it was soon in the net: an immaculate common. I have a season ticket for this pool, alongside around eighty other anglers; - but I’m usually alone. 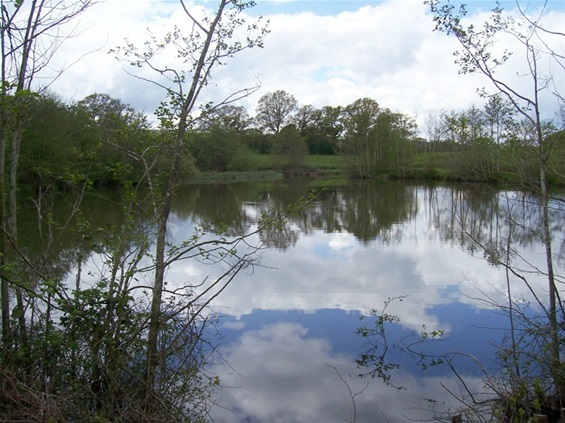 The ticket covers three other ponds – one of which is very “easy” indeed. But this pool is not easy. The water is clear, the fish are easily spooked and, until last year, it had not been fished for at least 15 years. This explains the superb condition of the fish. Yes, last year, when the first lines were thrown, carp were sometimes caught in numbers, including by me; but they seemed to have learned quickly, and it was another three hours, yesterday, before I saw further signs of feeding fish. The lake is a farm reservoir, and its water is sprayed on berries that end up in Ribena, by the way. There is one spot when a shallow shelf drops away into deeper water – a fine spot, but one favoured by the farmer for his irrigation pipes. Last week, there were two pipes there. This week, one has been dismantled, allowing me the chance to throw a line. The fish were present, in about five foot of water: the bottom was fizzing. I noticed that there were large numbers of tadpoles milling around. Were they the main attraction? I couldn’t compete with tadpoles, but I had bread. I decided to try free-lined flake, on the bottom. Sitting on the ground, as far back as I could, about five feet from the water’s edge, I flicked in a hunk of flake and balanced the rod on my stalking bag. The line flickered then drew tight across the surface. I struck and realised that this was a good carp. Unfortunately, with my rod at full bend and the Mitchell clutch screaming, the carp shot to my left and found a sunken snag. There was a boil on the surface and the line shot back, hookless. The bottom two feet had been completely “feathered”. Removing the damaged length of line I was thinking about removing myself from the swim: but there were still carp there. The bottom was still fizzing like champagne! The same approach led to a similar take, and I found I had struck, automatically, and there was something fast-moving and powerful on the other end. I tightened the clutch and decided to rely on backwinding – but it was a long fight for me – perhaps fifteen or twenty minutes in duration, because that fish simply did not want to come in. In all probability, it hadn’t been hooked before. It was an odd, swinging sort of battle, with plenty of side-strain. Finally, it lay on the mat, in my net – a lovely double-figure common, and more than compensation for the fish I had lost. In a daze, having just returned the fish, I stared down the path, which lay under clustering trees, and I could almost imagine my younger self, just standing there smiling, and nodding with approval. The cheeky chap that grabbed the crust..
What gets the stuff to the bank, Chris! I mean, whatever gets the stuff to the bank...of course..! My bag in the 80s was 'modern' , plasticky type with a zipper, in purple.